There are many awesome free family activities in New Zealand for a fantastic family holiday. From the mountains to the sea – there is spectacular scenery at every turn – the country is breathtakingly beautiful and best of all you don’t have to pay a cent to enjoy its beauty!!! 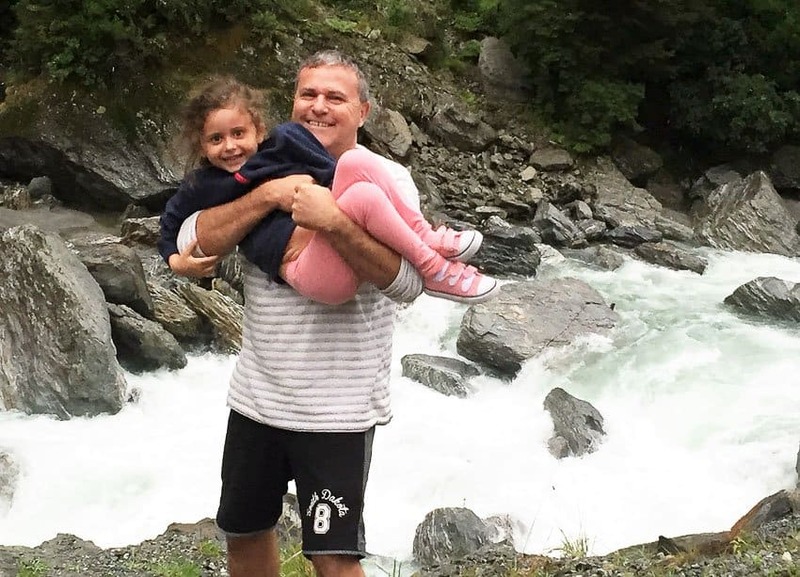 I have gathered up my families favourite free family activities in New Zealand from our recent road trip of the South Island. A walk around Christchurch’s botanical gardens is a great way to start the day. There is 21 hectares of parkland to explore including the lovely Avon River. The gardens are open every day from 7am and entry is free. Time Needed: depending upon whether you have a snack at one of the cafes, or simply take a quick stroll you might spend between 30-90 minute here. Recommended time is 45 minutes. Even if you are not interested in shopping, the Restart Mall is well worth a look. The mall is basically several shops housed within shipping containers – which came about after the tragic earthquake in 2011 which destroyed most of Christchurch’s buildings. The mall is very inspiring and has a funky modern vibe. The Restart Mall also houses the earthquake museum called “Quake City”. Whilst this museum is not free, its well worth a look to get a full appreciation of the devastation the earthquake caused. The museum is a perfect opportunity for children to learn about earthquakes and there are some activities aimed for children including building a city from Lego. Time Needed – depending upon whether you have snack or lunch at one of the cafes and how much shopping you want to do you may need 15-90 minutes here. Recommend time is 90 minutes to 2 hours including the museum. Click here for tips on road tripping New Zealand in a camper van. It is highly recommended to visit the 185 Empty White Chairs memorial and pay your respects to the people who lost their lives during the earthquake. This is a moving memorial site with each chair symbolizing a life lost. Time needed – Allow 5-10 minutes. 75 kilometres from Christchurch is the breathtaking beautiful Akaroa, a small seaside town, surrounded by gorgeous bays. The drive into Akaora is just as beautiful as Akaroa itself. Around every bend you will see beautiful views of the mountains and bays and there are plenty of opportunities to stop along the way to appreciate the gorgeous views. Once in Akaroa grab yourself some fish and chips and sit on the beach and soak up the view. If it’s warm enough the kids might enjoy a swim in the calm water or have a game of rock skimming. Time needed: Including the return drive from Christchurch and lunch 4 hours is recommended, although you could easily spend the day here if you have more time. Located between Christchurch on the east coast and Hokitika on the West Coast is Castle Hill. 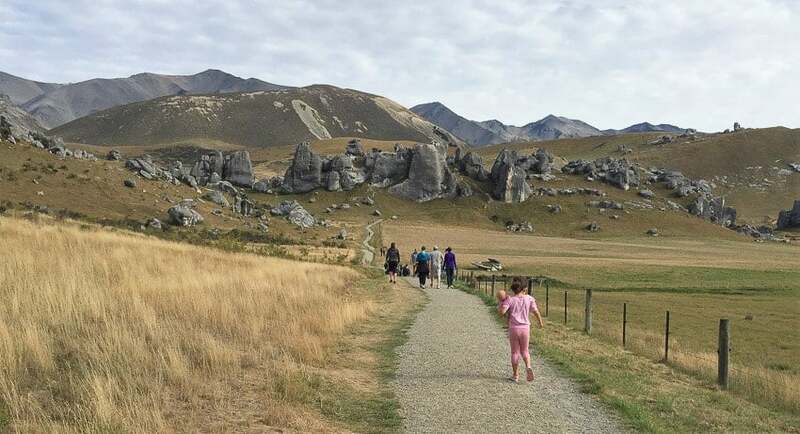 Castle Hill is the name given to the private property which holds an array of spectacular limestone boulders. The view of these gigantic rocks is like something out of a movie – and in fact was used in the 2005 movie The Chronicles of Narnia: The Lion, The Witch and the Wardrobe. Children will love exploring the mazes of rocks and climbing the natural staircase to the top of many of these magnificent boulders. Our 5-year-old climbed the boulders with ease so any fitness level is fine for this activity. Time needed: 30 minutes if you just wish to view the boulders, but up to 90 minutes is recommended to fully explore and climb the boulders. Just pass Castle Hill towards Hokitika is Arthurs Pass National Park. This area offers several great stops for exploring and photo opportunities on the side of the road. We stopped multiple time on this route to have a game of rock skimming, explore gorgeous streams, and simply admire the spectacular views from the various look outs. Basically, if you see a spot that looks interesting – get out and explore. Time Need – anywhere between 5-15 minutes at any stop that looks interesting to you. It is recommended that you make 2-3 stops in this area. The town of Hokitika is a good location to stop after driving from Christchurch and exploring Castle Hill and Arthurs Pass National Park. Whilst in Hokitika be sure to check out Hokitika Beach – famous for the huge amount of drift wood that covers the beach. The locals have made great art pieces out of the drift wood, including the famous “Hokitika” Beach sign. Time Needed: 5-10 minutes recommended to visit the beach. Before leaving Hokitika be sure to take a detour a check out Hokitika Gorge. The Gorge is located 33 kilometres from Hokitika or about a 30-minute drive. From the car park, there is a short walk across the swing bridge where you can see the beautiful blue river and spectacular gorge. Provided there is no one there when you visit – the spot is gorgeous to just sit in the quiet and take in the stunning views. Time Needed: 15-30 minutes recommended to enjoy the views at the gorge. You will need to 60 minutes for the return journey to Hokitika. Franz Josef Glacier is one of two glaciers accessible on the West Coast of the South Island. You have to see this to believe it – blue rivers of ice plunging down to the rain forest – it is a spectacular sight. Adults and kids alike will be mesmerized by the beauty of the glacier. To get up close and personal with the Franz Josef Glacier for free you can take one of several walking trails. The Franz Josef Glacier Valley Walk is a 90-minute return walk which will take you right to the face of the glacier. The walk is suitable for all fitness levels, with our 5-year-old doing it with ease. Time Needed: 90-minutes recommend to walk up to the glacier face as well as allowing time to stop at the several viewing spots along the way. 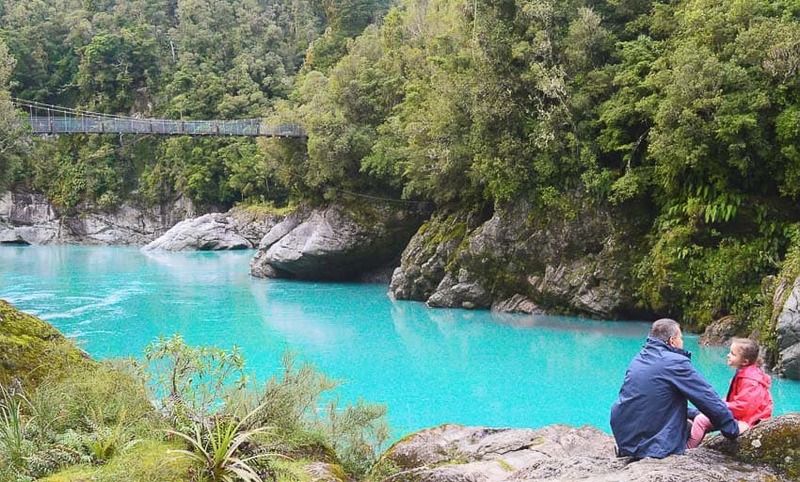 The journey to see Lake Matheson may be just as exciting for the children as the lake itself. The full circuit is around 90 minutes, with much of the walk being through thick rain forests fit for children to search for fairies and elves among the blue mushrooms. 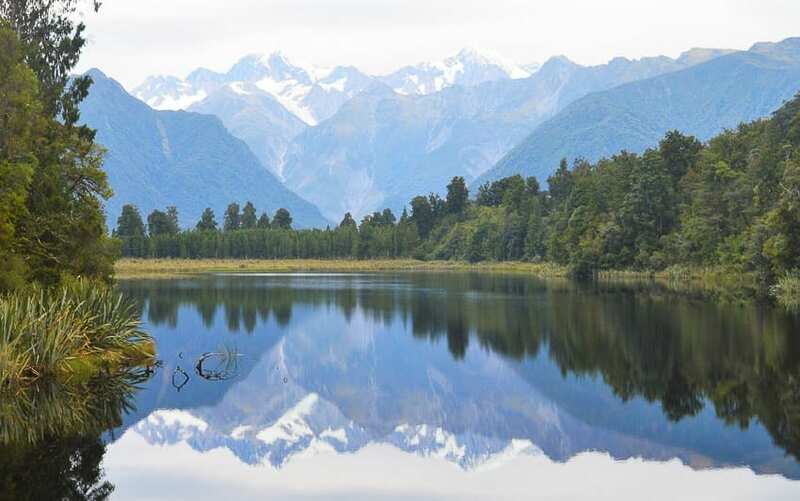 Once you reach Lake Matheson you will be rewarded with mirror reflections of the Southern Alps – one of the most iconic postcard scenes of the South Island. This is an easy walk suitable for all fitness levels. Our 5 year old did it with ease. Time Needed: Depending upon how fast your children walk 90 minutes to 2 hours is recommended. 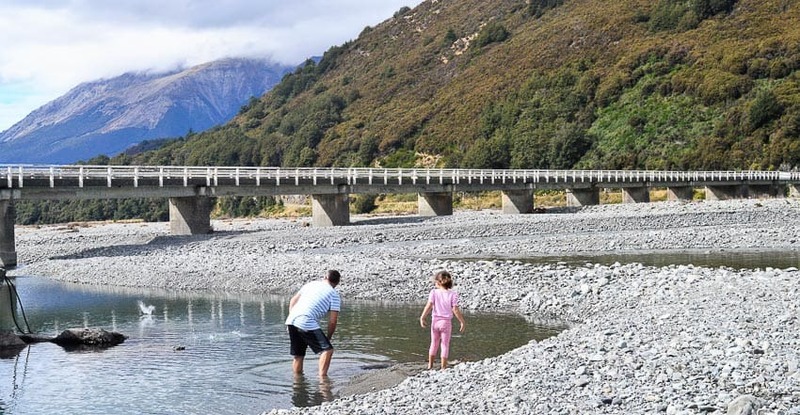 Driving in the South Island is never boring – but the drive from Haast to Queenstown offers endless gorgeous spots for the kids to explore. Pull up the car whenever you spot something interesting and lets the kids explore – I assure you there will be plenty of “oohhhh….ahhhh” moments on this route. Blue Pools – an easy 15-minute walk to see the beautiful crystal clear pools which are being fed by nearby glaciers. Fantail Falls – a few minutes’ walk from the car park you will see this great waterfall. The water is shallow with plenty of stepping stones for the kids to wade through the water. The shallow waters also offer a great opportunity for the kids to practice their rock skimming skills. Roaring Meg Falls – The colour of the water is absolutely beautiful and the view of the raging river below is amazing. Lake Wanaka – A quaint little town surrounds yet another spectacular lake in the South Island. Arrow Town – Another gorgeous quaint town to drive through, or great opportunity to stretch the legs and grab a snack. Time Needed: At least a day is recommended to do this drive comfortably – this allows between 5-30 minutes at each stop with perhaps one longer stop for lunch. Another scenic drive from Queenstown is the drive to Skippers Canyon. Unfortunately due to most of the road into Skippers Canyon being gravel, many car rental companies do not allow you todrive your rental into the Canyon – so this journey can’t be reached unless you have a private vehicle or go in on a tour bus. If you can get yourself there – you must! The drive to skippers canyon is unbelievable. Driving through the mostly one way narrow and steep road with sheer drops of several hundred meters is not for the faint hearted – but the views of the scenic gorge are not too be missed. The picturesque Shot Over River is also located within the canyon and if you have time you must join one of the tour groups to either jet boat or raft down the river. as paying to go up on the gondola in Queenstown – so save your money!! Time Needed: Allow a few hours to safely drive into the canyon and take in its beauty. Queenstown itself is set on Lake Wakatipu with the dramatic views of the Southern Alps everywhere you look. Queenstown is one of New Zealand’s most picturesque towns. You can spend hours walking around the lake taking in its beauty. There is a great playground right on the waters edge for the kids, with a café for mum and dad. You will all enjoy wandering around the shops and watching the many entertainers that scatter the streets. And once you are bored of all that – just sit back and continue admiring that amazing view! 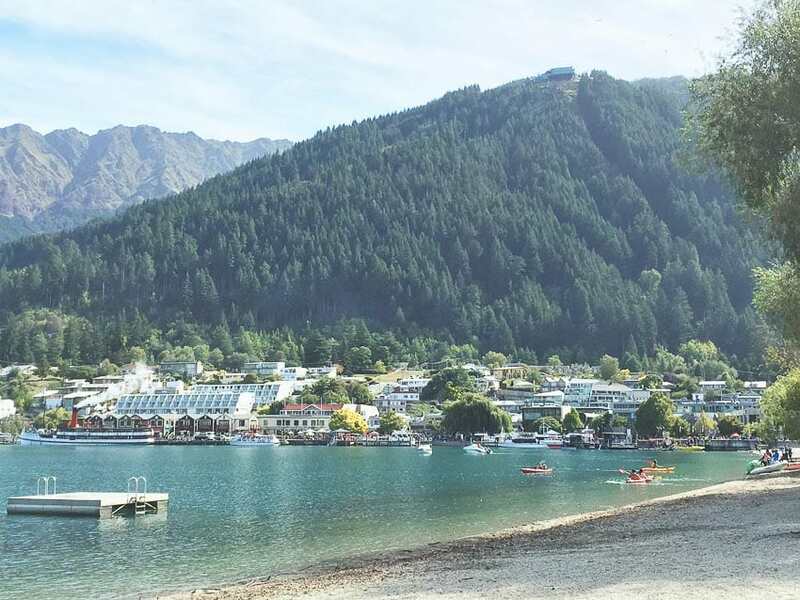 Time Needed: Allow a full day to enjoy all that the town of Queenstown has to offer. Click here and here for more great ideas on things to do in and around Queenstown. Whilst it is recommended to take a guided tour to Milford Sound from Queenstown – if the budget is tight you can do this drive yourself. The drive between Te Anau and Milford Sound is incredibly scenic with several must see stops along the way. You can not miss the beautiful sights on this journey – they are there are at every turn. However some recommend stops include Mirror Lakes, Knobs Flat, Cascade Creek, The Divide, Homer Tunnel and Mount Tutoko. 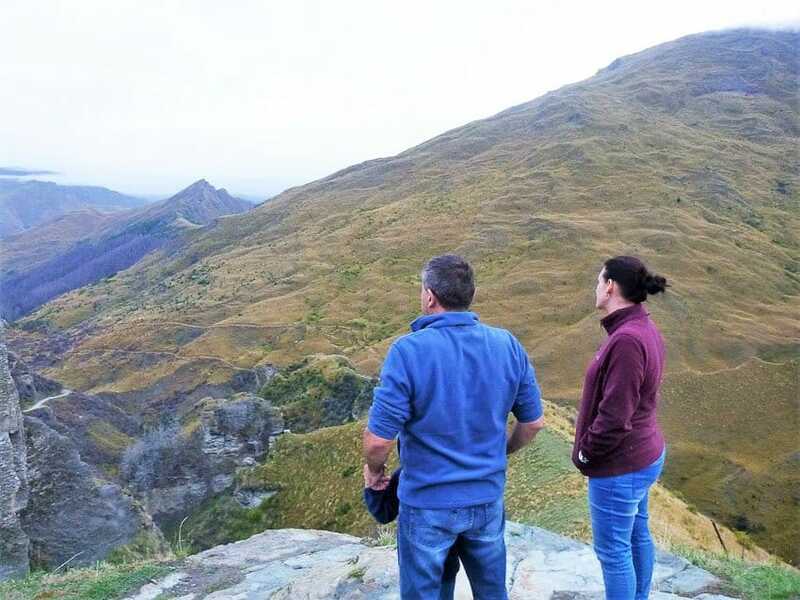 Time Needed: – factoring in the return journey to Queenstown and a boat tour of Milford Sound (which is not a free activity but a must see) – you must allow at least 12-14 hours for this trip. Driving to Mount Cook is just as exciting as being at Mount Cook itself. 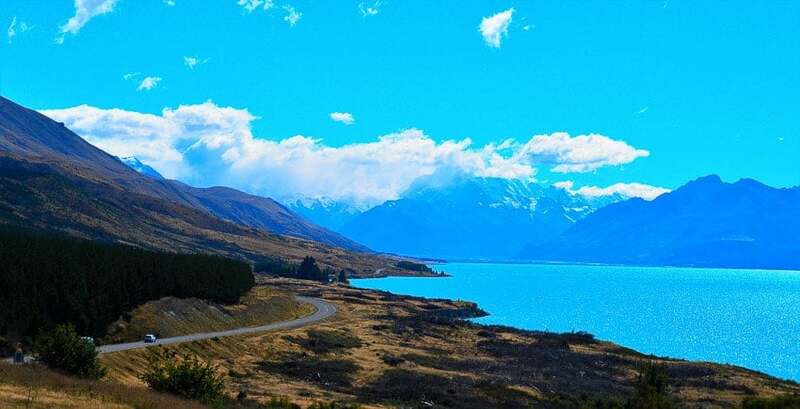 As you creep towards Mount Cook you will see your first glimpse of the beautiful snow capped mountains with the glacier blue lakes of Lake Pukaki n the foreground. This might just be the most beautiful landscape in all of New Zealand. Once you reach Mt Cook there are a variety of free walks to take to get a closer view of Mount Cook and its several Glacier Lakes. There is also a great tour of the lake and glacier which is not free but highly recommended. Time Needed – Assuming you stay overnight in Mt Cook or close by, a whole day is recommended for this activity. For more information about things to see on the way to Mt Cook and at Mt Cook itself, check out this website – www.newzealand.com. Located on Koekohe Beach are the mysterious Moeraki Boulders. These are huge boulders weighing several tonnes and up to 2 metres high, scattered across the beach. The smaller boulders could easily be mistaken for large turtles. Kids will love climbing over this mother nature playground as well as jumping through all the rock pools on the beach. Time Needed: – 30 minutes is recommended to see the Moeraki Boulders – longer if the weather is warm and you want to have a swim. For more information about the Moeraki Boulders, check out this website – www.moerakiboulders.com. Want even more free activities in New Zealand – check these 112 free activities in New Zealand. Heading to the North Island? Check out these free activities. Hopefully you find this list of free fun activities to do with your kids helpful. Want to save this for later? Click on the picture below to pin to Pinterest. Whats your favourite free activity in New Zealand’s South Island? Let me know in the below comments and I will add your recommendation to this article.